Stiffness, limitation of extension suggestive of retropharyngeal abscess. Trismus associated with peritonsillar cellulitis or abscess. Dry mucous membranes suggest dehydration (from odynophagia) and indicates severity of symptoms. Tongue elevation, sublingual/submental induration, poor dentition (particularly of mandibular molars) associated with Ludwig Angina. Unilateral tonsillar enlargement with contralateral uvular deviation suggests peritonisllar abscess. Fluctuance may be palpated. Tonsilar exudates suggest infectious pharyngitis (non-specific). Palatal petechiae suggest bacterial pharyngitis. Ulcerations of the anterior oral cavity are associated with herpes infection, lesions on the soft palate are suggestive of coxsackievirus infection. Rarely, a grey membrane in the posterior pharynx will suggest diphtheria. Tender anterior cervical lymphadenopathy may suggest bacterial pharyngitis. Posterior cervical lymphadenopathy is associated with infectious mononucleosis. Large, firm, non-mobile lymph nodes may suggest malignancy. Presence of conjunctivitis (also rhinorrhea, exanthema) associated with viral pharyngitis. Ulcers involving the hands, feet, in addition to pharyngeal lesions suggest coxsackievirus infection. Scarlatiniform rash associated with pharyngitis (particularly in school-age children) suggests streptococcal pharyngitis. Splenomegaly is associated with infectious mononucleosis. Newman, D., & Shreves, A. (2013). Sore Throat. In Rosen’s Emergency Medicine – Concepts and Clinical Practice (8th ed., Vol. 1, pp. 198-202). Elsevier Health Sciences. King, B. R., & Charles, R. A. (2004). 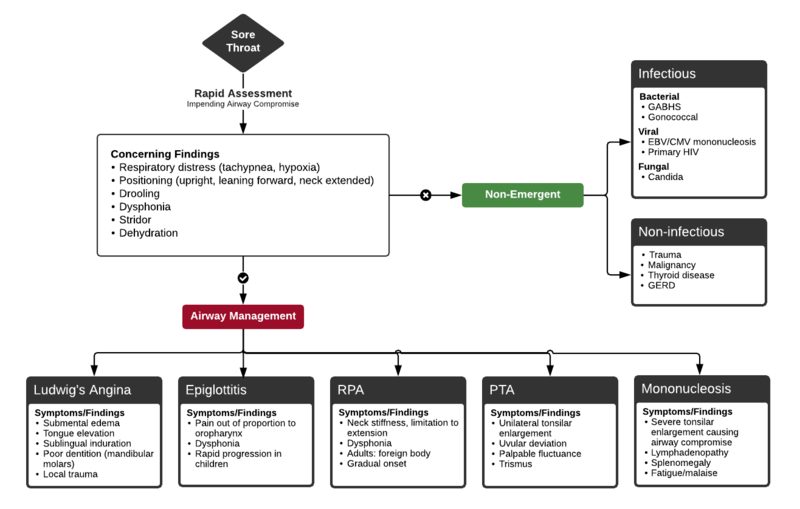 Pharyngitis In The ED Diagnostic Challenges And Management Dilemmas. Emergency medicine practice, 6(5), 1–24.